Well, my Singer sewing machine had to go in for repairs. After twenty years, it finally needed work. 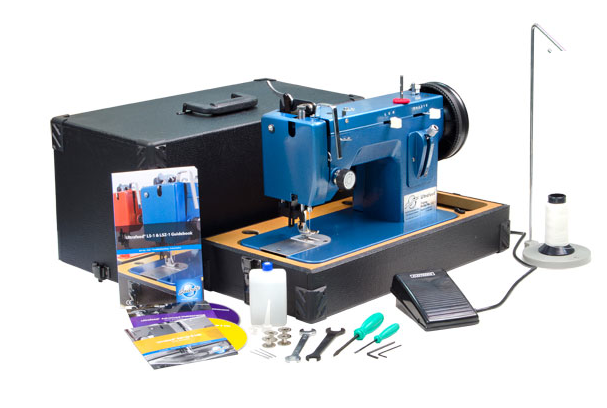 Since I have been sewing a lot more heavy things using canvas and upholstery material, I think the poor machine couldn’t cope so Dennis suggested that I get a new one and he just happened to know of a good sewing machine called the Sailrite Ultrafeed. So, I ordered the Sailright Ultrafeed LSZ-1 from Mason Sewing in Vancouver and it arrived within a week. It is portable, so I have it set up where the old machine was. It is really tough! I’ve had it sewing through eight layers of canvas (attaching straps to bags) with no problem! The machine is quite simple – it does not do anything fancy except that it has a zigzag feature which works really well. Other than that, it goes forward and it goes in reverse. It also has three positions for the needle which is great for trying to get really close to the edge of the material or for doing zippers. Its best feature though, is the walking presser foot. This really makes a difference when you are using heavy, bulky material – it doesn’t pucker but just slides along and creates a beautiful stitch. In order to learn how to use it, a series of video tutorials came with it and they are excellent! I’ve learned about the tension, how to change needles, the bobbin, maintenance and oiling and a number of other important things. My only criticism of the Sailrite Ultrafeed is their crummy light. It does come with the machine but it is not worth even attaching. I had to buy a better light (the Bendable Bright LED Light) which can be moved around and adjusted so that you can see details such as the stitches or even threading the needle. I think that the company should scrap the old light and just include this one because it is a really powerful light. I’ve made a bunch of different things already and have also hemmed Dennis’ heavy, heavy work pants without any trouble at all. I even sewed some fake leather and it turned out beautifully! What I also like is that I can sew light materials too. All I needed to do is change the needle and adjust the tension. So, in all, it is a great machine, very tough and easy to use. It sews through anything and is well built – made of metal. The other machines that I looked at in comparison had many plastic parts and didn’t look as rugged or as tough. I think I’ll be able to make good use of the Sailrite Ultrafeed for a long time. I am using it a lot for making bags and you can check out some pics of the bags that I’ve made on our other website: Bowls and Bags.